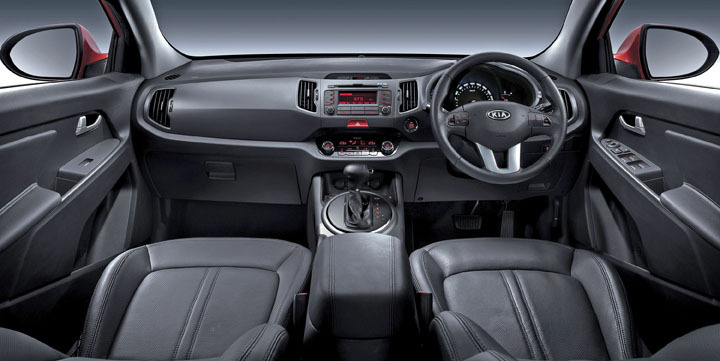 Kia Motors SA launched the new Sportage range in Mozambique recently. We paid a flying visit. The folk at Kia and Hyundai are grinning a lot, lately. In the words of Ray Levin, CEO of Kia Motors SA, "the soccer World Cup marketing exercise cost us a bundle, but it's paying off handsomely." He won't say how handsomely; he just grins. The sister companies don't report individual or combined SA sales figures to NAAMSA either, but rumour has it that their efforts currently see them unofficially at No. 2 in the sales charts. Asked directly: "Are you at No. 2?" he just grins and replies, "good guess." The only thing on which Levin would comment is a long-standing suspicion that of the two brands, Kia is aimed more upmarket. He confirmed that this division's products would in future be pitched toward a more affluent market sector. Still on the subject of smiles, Kia's third-generation Sportage range announced recently is slightly longer, wider and lower than the outgoing model. It is also 91 kg lighter with co-efficient of drag (Cd) reduced from 0,40 to 0,37. Sleeker and instantly recognisable as a Kia with the new family "tiger" face, it is pitched as an urban-friendly compact SUV ideal for today’s consumers – using less fuel and emitting less CO2. The range consists of six petrol driven models and four diesels, in a mix of two- and four-wheel drive versions, ranging from an entry-level 2,0 litre, petrol-engined 4x2 with five-speed manual transmission to a 2,4 litre petrol driven awd with six-speed automatic and an awd 2,0 litre diesel with the same auto 'box. Output of the 2,0 litre petrol motor is given as 122 kW at 6 200 rpm and 197 Nm of torque at 4 600 rpm. Claimed zero to 100 km/h time is 10,7 seconds with a top speed of 182 km/h. The 2,4 litre petrol version develops 130 kW of power at 6 000 rpm and 227 Nm at 4 000 rpm, while the 2,0 litre diesel engine produces figures of 130 kW and 392 Nm. All are well equipped with even the base model boasting alloy wheels, electrically adjustable door mirrors, tinted glass, front fog lamps, full size spare wheel, air-conditioning, automatic light control, auto-dipping mirror, electric windows front and rear, power outlets in front centre console and boot, steering-wheel mounted audio controls, tilt adjustable steering wheel, cloth upholstery, height adjustable driver’s seat, radio/CD player with 6 speakers, aux, USB and iPod compatibility, four channel ABS with EBD, ESC , BAS, TCS (Traction Control System), CBC (Cornering Brake Control), DBC (Downhill Brake Control), HAC (Hill-start Assist Control), dual front, side and curtain airbags, central locking, keyless entry with alarm system, rear parking assist system and Isofix child seat anchors. Other 4x2 models have, in addition, ASD (Amplitude Selective Damper) front and rear shock absorbers, steering wheel mounted cruise control, dual-zone automatic climate control, roof rails, electric folding door mirrors, LED daytime running lights, cooling front glove box, powered driver's seat and leather upholstery. On-demand AWD models are fitted with 18-inch alloy wheels, engine Start/Stop button with smart key, improved sound system with 6-CD disc changer, built in subwoofer and external amplifier, and rear view camera. A full panoramic sunroof is available as an optional extra on these models only. Loading space is given as 740 litres, expanding to 1 547 litres with rear seatbacks folded, while six-footers can sit comfortably in all five seats. The familiarisation drive was a bit restricted by not having access to 50 ppm diesel in Mozambique (the cars were trucked between Johannesburg and Komatipoort to be sure they could get home again on one tankful), narrow roads, heavy traffic and the authorities' alleged use of deliberately-inaccurate speed trapping equipment. In any event, the Sportages proved to be quick, quiet and comfortable with very good road manners. A section of broken blacktop, little more than a spider web of macadam connecting potholes, showed the suspension to be quite firm but not uncomfortably so.